Good morning! Today I’ve got a steamy coffee-inspired polish (and I sit here and drink my tea). I may be allergic to caffeine, but WingDust Collections’ “Tall, Dark & Roasty” is a jolt to the system in a good way. It has a deep chocolate brown jelly base, with blue-gray tones underneath. There are gold-toned flakies as well as actual 24kt gold flakes and 12kt white gold flakes. It also has a nice purple shimmer for depth and tiny iridescent hexes that flash red or blue depending on the light. 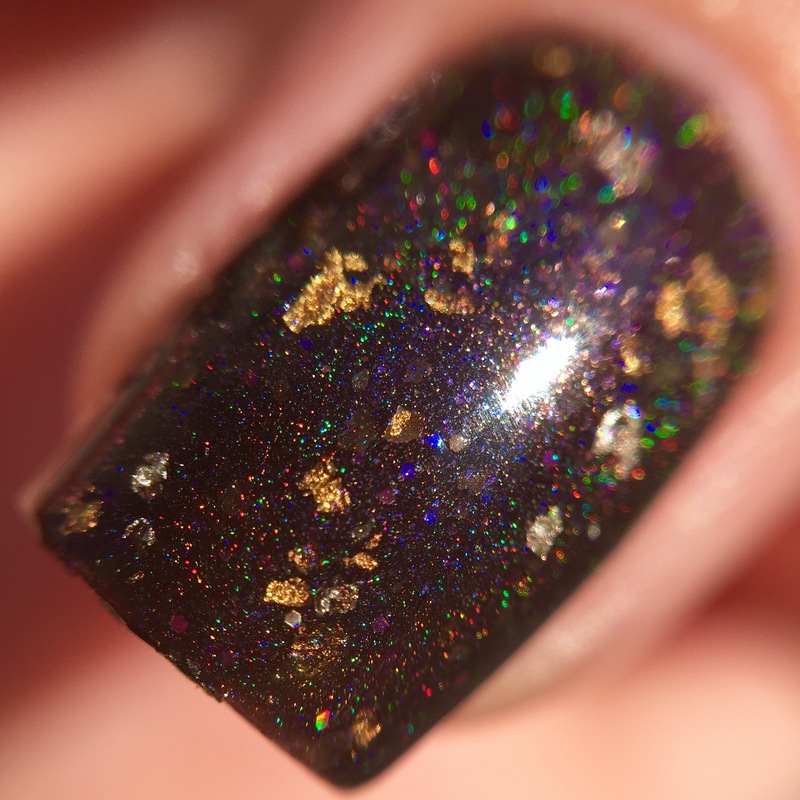 Oh, right- I forgot to mention there’s a fairly strong holo in there too. 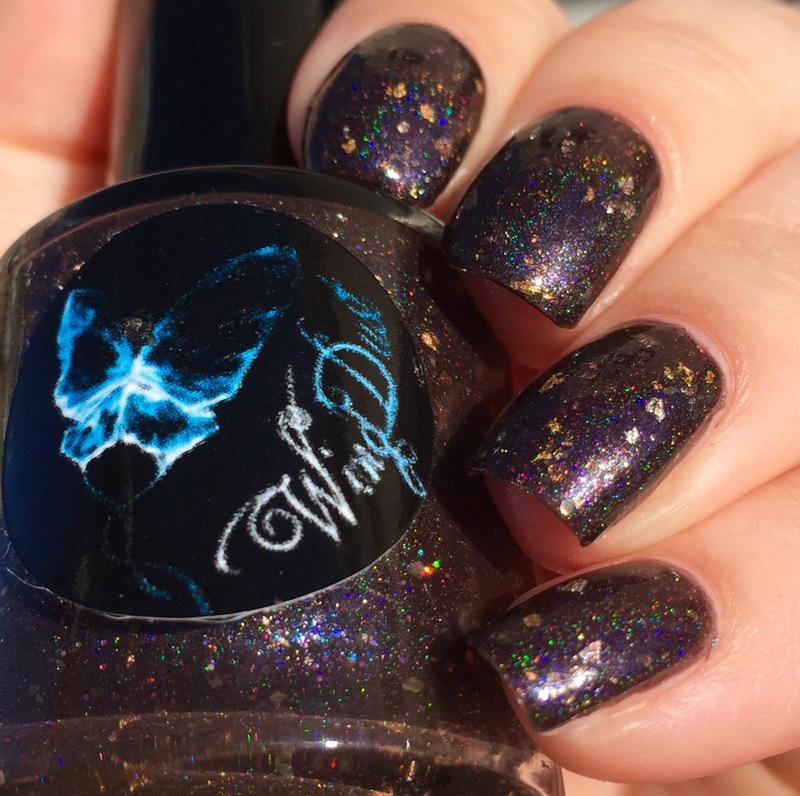 WingDust is amazing at making polishes with a million little elements that somehow all come together perfectly, and “Tall, Dark & Roasty” does not disappoint in this regard. The formula is really great- even with all those different things packed in there, it doesn’t go on too thick and isn’t at all goopy. 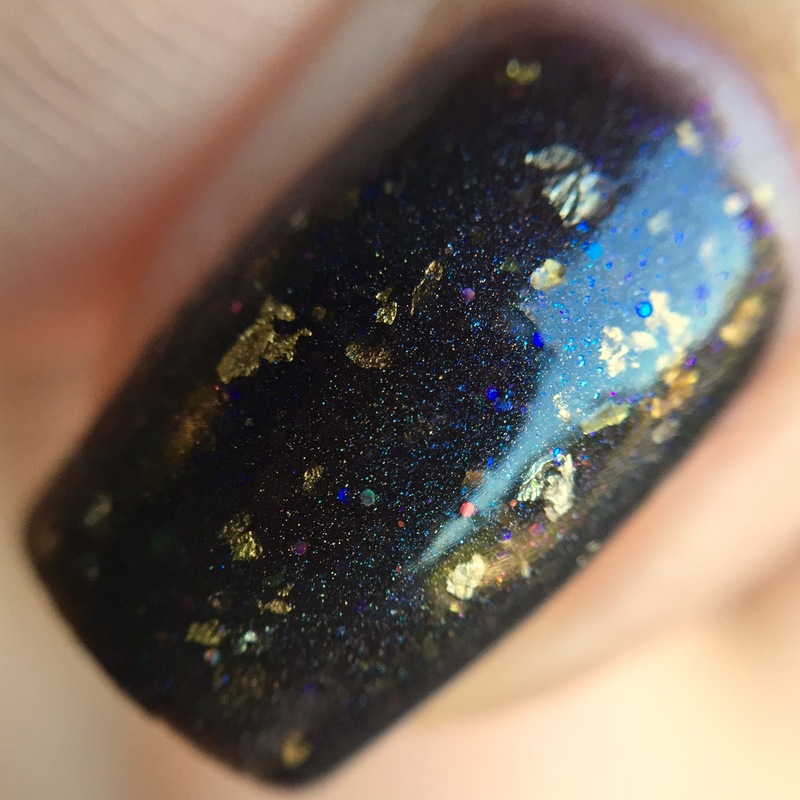 This is two coats (and it’s a jelly!) and I was really happy with the opacity. Heck, since it only takes two coats, I can really skimp to make it laaaaast and laaaast (this is a thing I do with all my most precious polishes). WingDust Collections is one of my favorite indie brands because of their ability to mix things together to create something beautiful and incredibly unique. If you’re looking for something to make you feel luxurious and special, I strongly recommend their polishes. 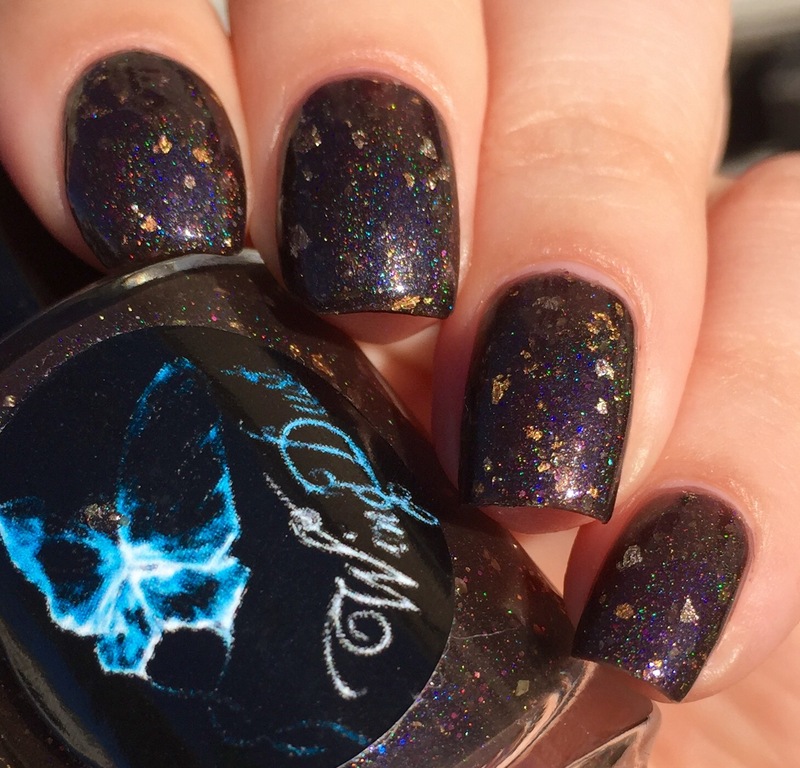 Hands down, WingDust is my go-to for gold flake polishes, both snazzy topcoats and full-on colors like this. I promise, they’ll impress you every time. At the moment, it looks like their Etsy shop is down, but definitely check them out on Facebook. I can not get enough of her polishes. 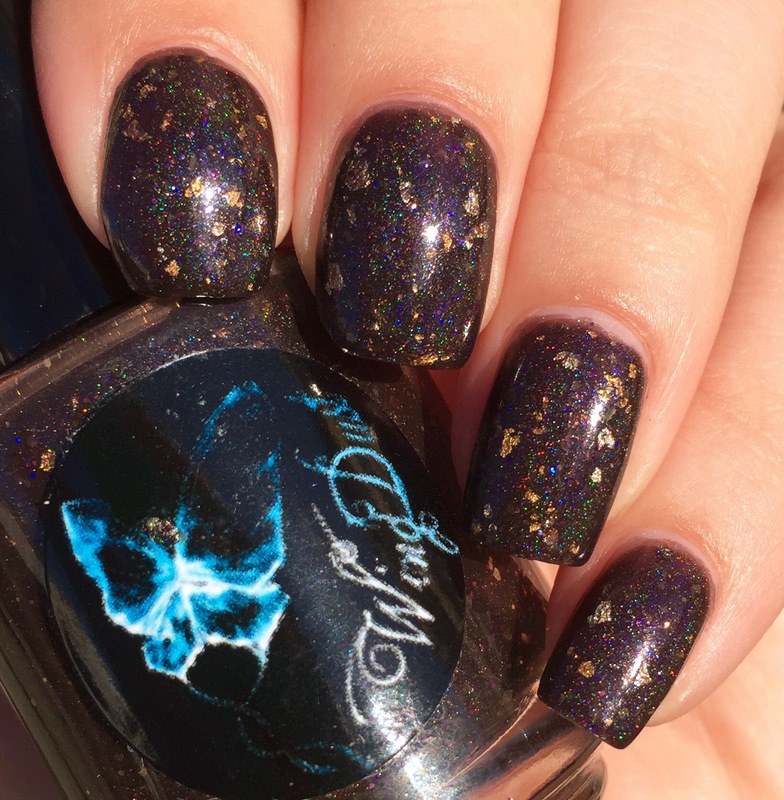 I absolutely love WingDust, and this polish is stunning! What a stunning color! I love all of my Wing Dusts. I’m not sure what’s up, but her shop has been up and down for months now. I read on her Facebook that she was having a hard year in her personal life. I (selfishly) hope things look good on the horizon- I would hate to see her unique polishes disappear. Absolutely beautiful swatch and polish! Wow. This is just…wow. Amazing. I love love love flakes in polish!